This year’s camera technology at the Consumer Electronics Show in Las Vegas was a mixed bag of true innovation and beefed up current technologies. No, there were no truly exciting camera breakthroughs. The earth didn’t turn on its axis. 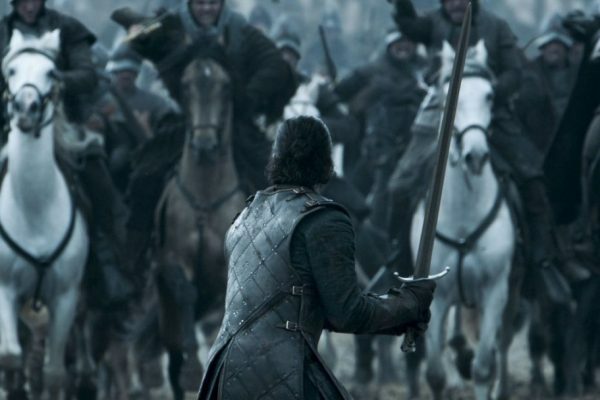 Camera sensors were tweaked (8K resolution was a talking point), AI found its way into optical systems (as it has in smartphone photography), and new VR/360 video cameras were launched to make the format more appealing to creators. It was a year of consolidation in many ways. But there was enough to interest both professional and consumer camera enthusiasts. In the surprise category was the fact that Sharp is launching a camera. Right, okay. Absorb that fact. Not only is Sharp getting into optics, it is doing so in a pretty big way. The micro four-thirds sensor prototype they had on show will be capable of shooting 8K video (7680×4320 resolution) at 30 frames per second (fps) using the H.265 video codec. Similar in form to the recent Blackmagic Pocket Cinema Camera 4K, it sported a 5-inch flip out screen, full-sized HDMI port, USB-C connection, headphone and 3.5mm microphone jack, plus a mini-XLR input. That and the fact that it’s a handheld camera, shooting 8K. Full specifications will be available in the spring, but check out the first look review below. Less surprising but good to see their hat in the ring was Panasonic announcing its full-frame mirrorless Lumix S cameras due to launch in March. Taking on the likes of Canon, Sony and Nikon in the prosumer market, the Lumix S1 is built around a 24.2 mega-pixel (MP) full-frame CMOS sensor that shoots 4K at 60p, with 4:2:2 10-bit internal video recording and 4K/60p HDMI output options available. The S1R will have a 47.3 MP sensor with the same video capabilities, aimed more at the professional photography enthusiast. 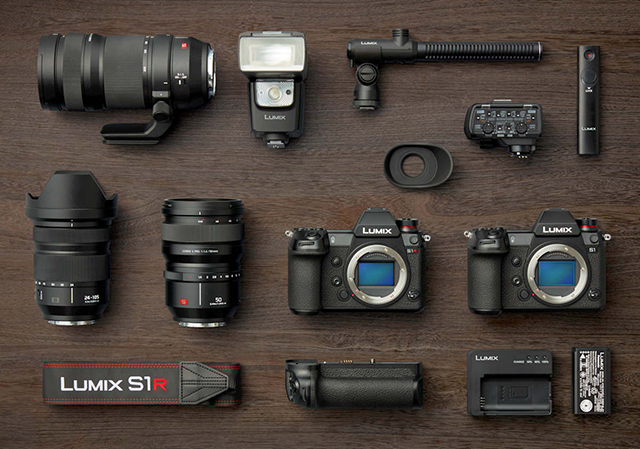 Both cameras feature an L-mount lens system compatible with Leica lenses and 5-axis body stabilisation – though attaching a Lumix S series lens will provide both lens and body stabilisation. Two Chinese smartphone manufacturers went down the route of upgrading their camera sensors. 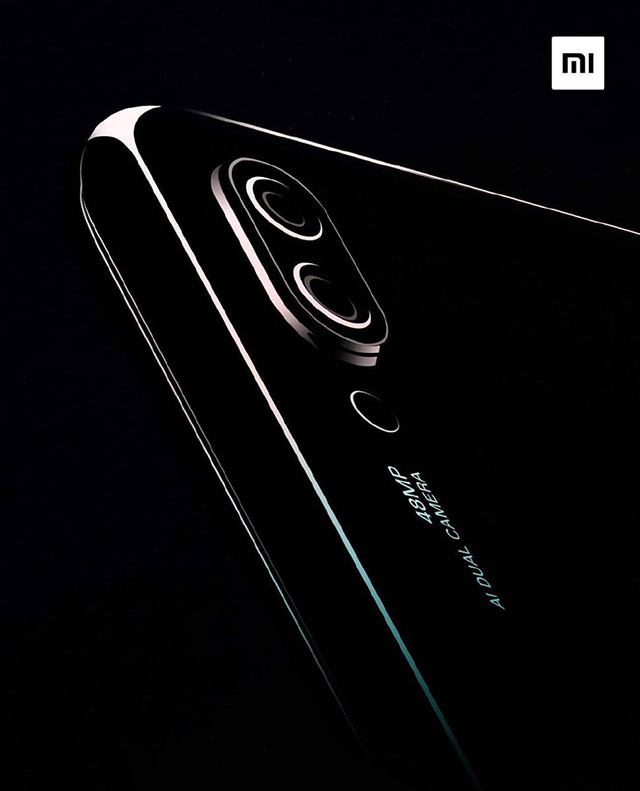 Both Xiaomi (who had their official launch in the UK in November 2018) and Hisense have added a 48 MP sensor to their new phones. Xiaomi’s Redmi Note 7 is part of the company’s budget phone series so is not expected to break the bank and may offer a serious challenge to the likes of Apple and Samsung in terms of image quality and price. Meanwhile the Hisense U30 will feature a 20 MP selfie camera and a 5 MP depth sensing camera alongside the generous 48 MP main camera. Both smartphones will feature the Snapdragon 675 chipset with a multi-core AI engine optimised for gaming, 4K video and HDR. Content creators, Youtubers, extreme sporters and outdoors types found a number of interesting options for shooting video and pics. The Obsbot Tail (odd name) is a 4K 60p AI-enabled camera that has advanced auto-focus tracking. Marketed a bit like a skater’s best friend it is a 12 MP camera mounted on a gimbal for smooth shooting. It is designed for solo shooting and responds to hand gestures. It’s on Kickstarter now, where you can get it at around half of the expected retail price. The tiny wearable video camera market is not exactly crowded. Welcome to the wireless Opkix One designed specifically for social media video enthusiasts, lifestyle shooters and Instagram junkies. This dual camera package comes with an array of accessories. The Egg capsule holds both cameras, stores your 1080p footage (up to 72 minutes) and transfers it to your smartphone via an app. 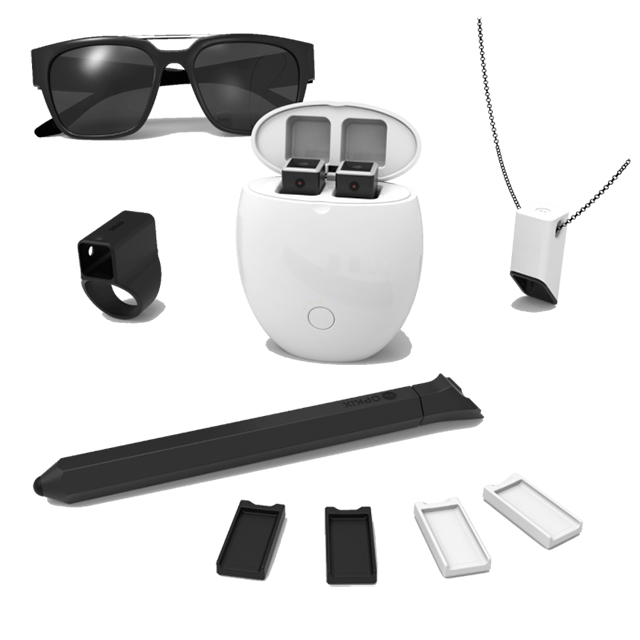 Three different mounts are available for the Opkix One including a selfie stick, a necklace and eyewear. It looks neat and is a cool concept, but with only 15 minutes of continuous shooting it may not be one for serious video enthusiasts. Kicking the cool into binoculars was the DoubleTake from Canadian outfit NexOptic. The DoubleTake is a kind of binocular handset that is more camera in concept. It has a 12 MP sensor which can send photos to your mobile device and record 4K video. To help crunch the numbers it has a built-in quad-core processor. A 5-inch LCD display replaces the traditional viewfinder/goggles set up and the 2.5x and 10x optical zoom get you close to the action. 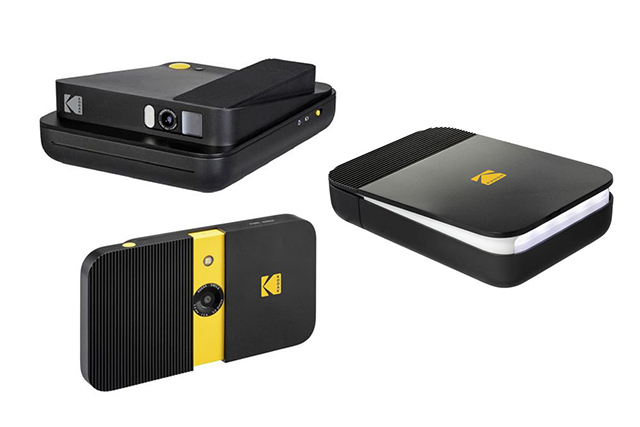 For educators and video collaborators there is the Panacast 3. Shooting a 180-degree video in panoramic 4K resolution with in-built stereo microphones, it is billed as a must for collaborative teams. Plugs into software like Skype, Slack, GoToMeeting, Google Hangouts and Moodle. Fits in the palm of your hand so no lugging huge bits of kit around with you. No UK price but you can purchase it direct for $895. 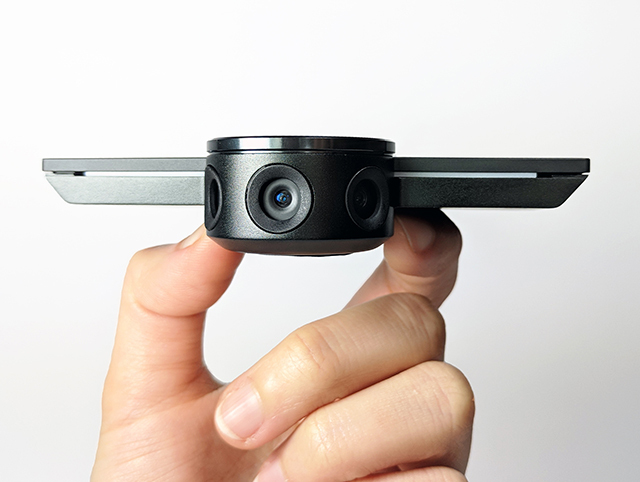 The Panacast 3: a tiny VR180 panoramic cam. 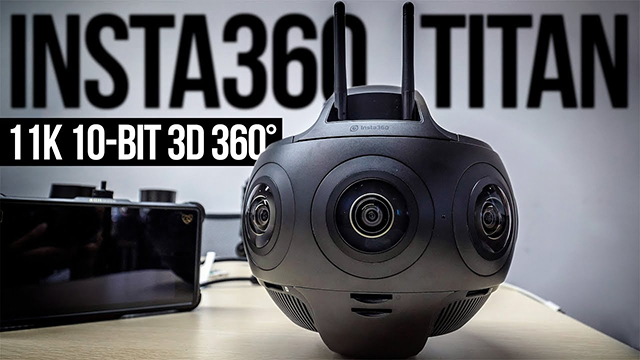 Insta360 proved themselves the overlords of immersive camera technology with the official launch of the Titan professional cinematic VR camera. It can capture 11K images for 360 video or 10K resolution for true 3D VR using its eight micro four-thirds sensors. And it can also shoot higher frame rates for slow motion with 8K at 60fps and 5.3K at 120fps. Throw image stabilisation and 10-bit colour into the mix, plus the fact that its clever software allows you to view high resolution images on your smartphone, and immersive cinema is now more readily available to the masses (okay, the £15,000 price tag is a sticking point). 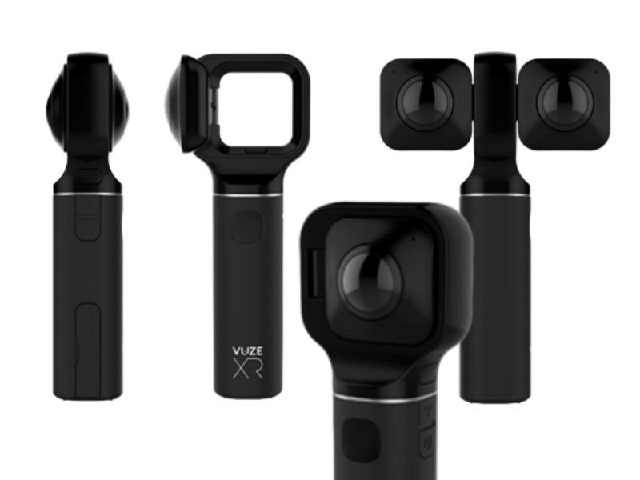 For mobile VR/360 shooters who want an alternative to the Insta360 One X, Vuze launched its innovative XR camera with multiple shooting options. Two 180-degree lenses can be used to shoot in either Google’s VR180 format for true 3D or 360 Video in 2D at 5.7K. In-camera stitching saves time and the addition of a smartphone editing app (with a live streaming mode) means you can create VR content on the move. Currently priced at £399. 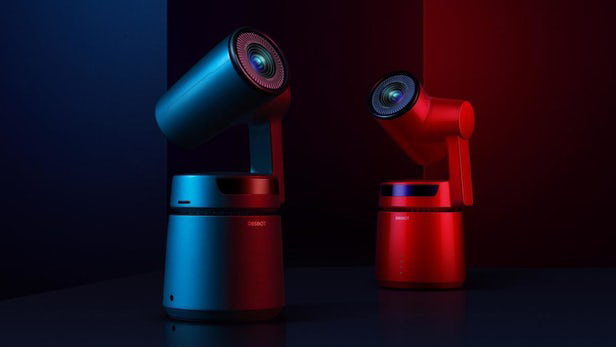 VR, gaming and machine vision require special camera equipment so there’s not much in the commercial slot, but at CES 2019 there were at least two companies flaunting specialist depth-sensing cameras. First up is a collaboration between eys3D and Lucid. Axis is a depth-sensing VR180 camera that is capable of creating 3D depth maps to recreate scenes for animation, gaming, VR and augmented reality. This single handheld unit can scan and reconstruct people, objects or scenes in 3D point cloud or depth map format. The Axis uses stereo lenses and infra-red sensors to get millimetre accuracy. The aim of the camera is to help developers re-create 3D scenes at lower cost – expect it to be launched in the autumn. Equally futuristic is the Pico Zense camera. The Zense is a high resolution time-of-flight sensing camera – TOF devices are range imaging, measuring the time-of-flight of a light signal (such as a laser or LED) between the camera and its subject for each point of the image. 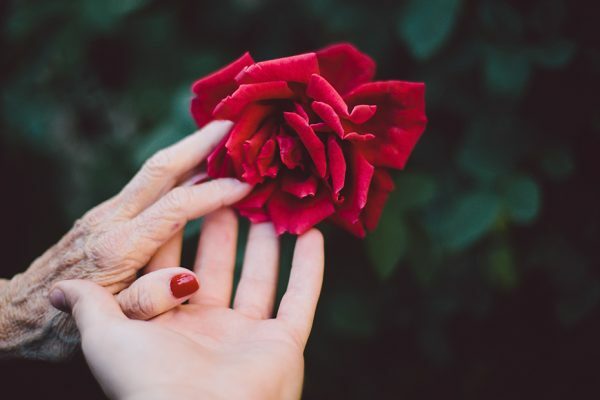 TOF cameras are deployed for machine vision in self-driving cars or drones, but also in VR where it helps in scanning 3D objects and creating virtual environments. It doesn’t look like much but the Zense comes in two sizes (ostensibly for indoor and outdoor scanning) and promises to incorporate functions such as gesture recognition, skeletal point extraction, perceptual ranging, face recognition, real-time autonomous positioning/mapping, and AR. Pico’s Zense is a depth-sensing 3D imaging cam for robots and humans. Time for something a bit more light-hearted. 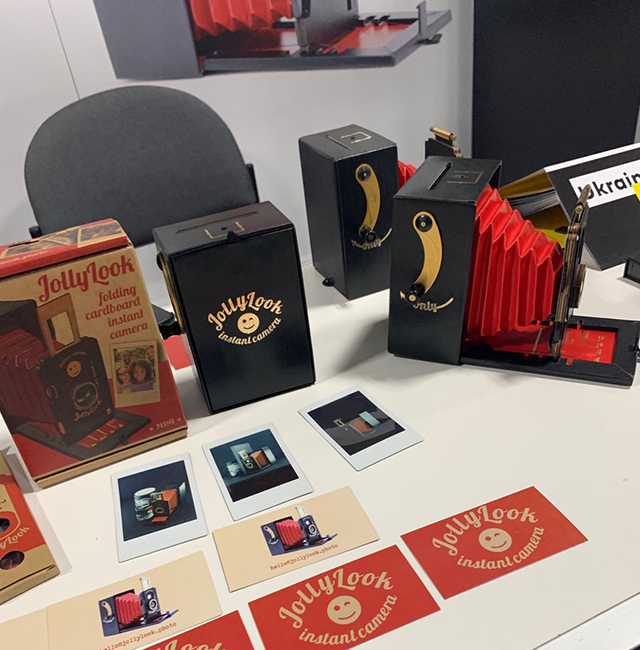 There were two notable palate cleansers from C+A Global in collaboration with Kodak and a Ukrainian startup called JollyLook. 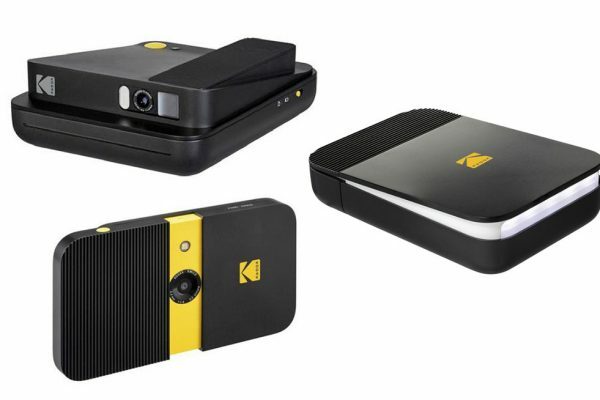 Each year it seems Kodak revamps its legacy cameras for the digital generation. This year it was the launch of the Smile hybrid camera and printer range. There’s a lot to like. Like the instamatic you can print out pictures from the Smile Classic, you can also print out pics you’ve taken on your smartphone and save your favourite shots from the Smile to a micro SD card. The 10-megapixel Smile Instant Print Digital Camera prints out 2 x 3-inch photos with adhesive backs so you can stick them anywhere (as did the Printomatic in 2017). It also has a micro SD slot and a preview feature for you to edit photos, add filters and effects before printing. 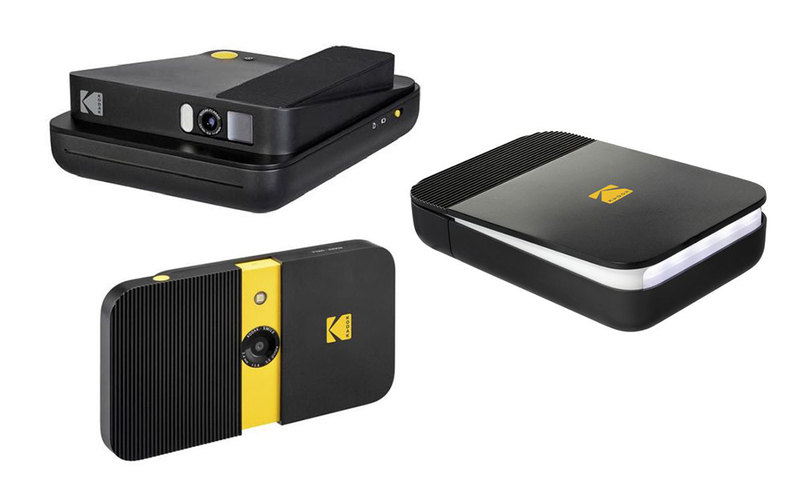 If you don’t need a new camera then the Kodak Smile Printer connects to your smartphone using Bluetooth so you can take a pic, edit it in Kodak’s app and print it out on the same 2 x 3-inch format as the Instant Print. Neato. There’s been a bit of controversy around the late delivery of the JollyLook camera but now it’s here. This vintage looking cardboard instant camera looks incredible and comes with a range of accessories such as polarising filters and magnetic strips so you can attach your snaps to the fridge. Not especially groundbreaking but beautiful nonetheless and you can buy the camera with accessories for less than £100. Finally, there was the useful, cool concept stuff that was either niche or novel. Trailguard AI is a remote camera sensor that catches poachers of endangered species in the act. The camera was a success on its launch but precious battery power was sapped by the number of false alarms or animals triggering the system. 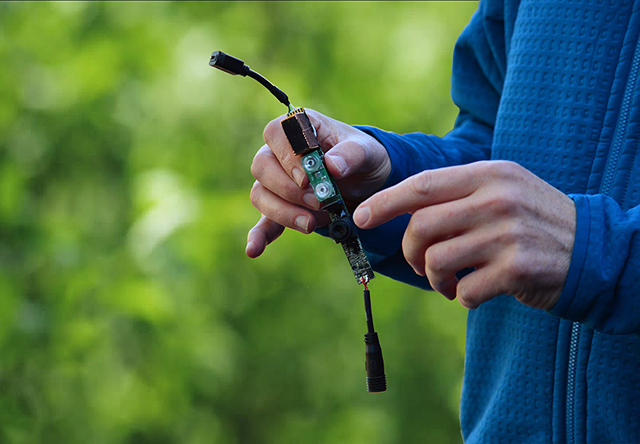 Now the Trailguard AI 2019 version is powered using Intel’s Movidius Myriad 2 Vision Processing Unit, a state-of-the-art, system-on-a-chip that allows filtering of non-human images. When a poacher is detected the camera alerts rangers on a rapid response team to arrest them. The system also saves pictures to create a gallery of poachers for law enforcement to tackle. Created in partnership with the Leonard DiCaprio Foundation this incredible system will be used in six of Africa’s iconic national parks in the first six months of 2019. Trailguard AI will stop poachers in their tracks. CrescentTech are a group of engineers with a passion for healthcare and technology who have developed the world’s first dual camera headband for surgeons. Crescent Vision captures footage that can be viewed on mobile devices, PCs or VR in sterescopic 3D. That’s too much detail for you and I but optimal to help surgeons teach medical students, interns and other surgeons. Camera sensors are upgraded regularly but it’s usually an increase in the number of pixels. At CES 2019 the French company CEA-Leti was demonstrating a curved camera sensor that it says will revolutionise the camera industry. Pixcurve will potentially shrink camera sizes by half as it allows lenses to be built that use fewer lens elements. That’s in the revolutionary mould if not entirely redefining the camera. Among the benefits of using Pixcurve are cheaper cameras, quicker assembly and improved performance. Well that’s it for our CES 2019 camera round-up. Check out the links for more info and if you need a quote on video for your business be sure to contact us!